I love this scene. Amidst the gargantuan cheese spread here and there throughout the sprawling 4 hours this small scene is one of the few which resonates with authenticity. Charlton has never looked more chiseled and dashing in this moment (the lighting is meant for him not for her) and Nina is understated and believable. Her small scene following this, calling out her servants/slaves, is taught and perfectly executed. Nina died in 2008. 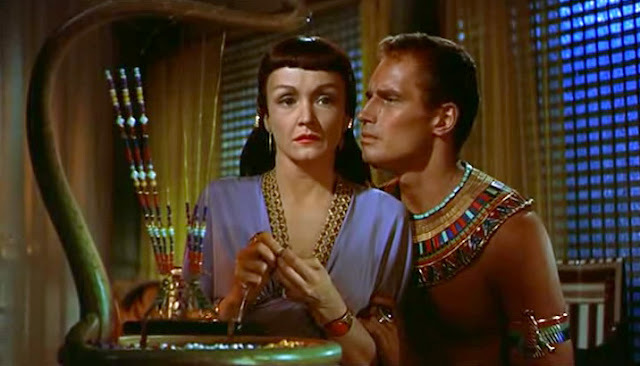 I love the scene too where Nefretiri (Anne Baxter) confronts and kills slave Memnet (Judith Anderson) who is about to reveal Moses' origins. Its terrificly paced and acted and the colors are now so vivid on hd it looks like it was shot yesterday! After Nefretiri kills Memnet she goes on and passionately kisses Moses. Nothing like a killing to get one's blood going.